Earn up to 20,792 reward points. Sweet 6L6 overdrive you can use with your favorite cab. 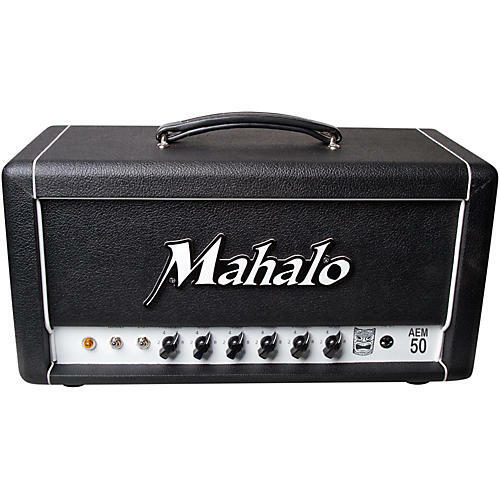 Run the gamut of clean to classic rock gain with the Mahalo AEM50 45W tube guitar head. Dynamics, a usable master volume, and Mahalo's unique preamp design that loves pedals make the AEM50 one of the most versatile amps you'll play. From crisp cleans to classic British style gain the AEM50 delivers. It comes loaded with a pair of 6L6 power tubes and 12AX7 preamp tubes to create a wide gain and tone range that stands out from the crowd and allows you to control your gain with the guitar volume knob. A true players amp the AEM50 has a great sounding master volume and presence control to keep you sounding great even at lower volumes. The AEM50 runs 6L6 power tubes and produces British flavored gain while producing about 40 watts. Three 12AX7 tubes drive the preamp and a master volume make the AEM50 a true players amp. The AEM50 delivers crisp clean tones and will rock when you want it to. Very touch sensitive, the AEM50 cleans up by simply rolling off a little volume on your guitar.